01 Giovanni Aleotti 1999 Italy Cycling Team Friuli 3t 46' 15"
02 Simone Piccolo 1997 Italy Team Casillo Maserati 00"
03 Marco Murgano 1998 Italy Team Casillo Maserati 00"
04 Matteo Jorgenson 1999 USA Chambéry Cyclisme Formation 00"
05 Simone Zandomeneghi 1997 Italy Iseo Serrature Rime Carnovali 08"
06 Gregorio Ferri 1997 Italy Zalf Euromobil Désirée Fior 11"
07 Martin Marcellusi 2000 Italy Velo Racing Palazzago 11"
08 Filippo Zana 1999 Italy Sangemini - MG.Kvis Vega 11"
09 Davide Bais 1998 Italy Cycling Team Friuli 11"
10 Mattia Bevilacqua 1998 Italy Team Franco Ballerini 11"
11 Kevin Colleoni 1999 Italy Biesse Carrera Gavardo 11"
12 Alois Charrin 2000 France Chambéry Cyclisme Formation 11"
13 Miguel Heidemann 1998 Germany Hermann Radteam 11"
14 Davide Botta 1997 Italy Team Colpack 11"
15 Andrea Pietrobon 1999 Italy Zalf Euromobil Désirée Fior 11"
16 Fabio Mazzucco 1999 Italy Sangemini - MG.Kvis Vega 24"
17 Luca Mozzato 1998 Italy Dimension Data CT 28"
18 Anthony Jullien 1998 France Chambéry Cyclisme Formation 28"
19 Luca Colnaghi 1999 Italy Team Colpack 28"
20 Nic McKibbin 1998 Great Britain Holdsworth Zappi RT 28"
21 Manuel Belloni 1998 Italy V.C.Mendrisio-PL Valli 28"
22 Daniil Marukhin 1999 Kazakhstan Astana City 28"
23 Alessandro Iacchi 1999 Italy Team Franco Ballerini 28"
24 Nicolas Dalla Valle 1997 Italy Tirol KTM Cycling Team 28"
25 Valere Thiebaud 1999 Switzerland Akros-Thömus 28"
26 Quentin Grolleau 1998 France A.V.C. Aix-en-Provence 28"
27 Adam Kristof Karl 1999 Hungary U.C.Monaco 28"
28 Nicholas Rinaldi 1997 Italy Iseo Serrature Rime Carnovali 28"
29 Dinmukhammed Ulysbayev 1998 Kazakhstan Astana City 28"
30 Mattia Baldo 1997 Italy Iseo Serrature Rime Carnovali 28"
31 Vojtech Sedlacek 1999 Czech Republic C.C.Etupes 28"
32 Nikita Martynov 1999 Russia - 28"
33 Davide Casarotto 1997 Italy General Store 28"
34 Jason Saltzman 1997 USA Holdsworth Zappi RT 28"
35 Olzhas Bayembayev 1999 Kazakhstan Astana City 28"
36 Michael Belleri 1999 Italy Viris Vigevano 28"
37 Edoardo Francesco Faresin 1998 Italy Zalf Euromobil Désirée Fior 28"
38 Dimitri Mukhomediarov 1999 Russia Lokosphinx-elite 28"
39 Johan Moreno 1998 Colombia Coldeportes Bicicletas Strongman 28"
40 Brayan Hernandez 1997 Colombia Coldeportes Bicicletas Strongman 28"
41 Alexander Tarlton 2000 Germany Hermann Radteam 28"
42 Tommaso Fiaschi 1997 Italy Beltrami TSA-Hopla-Petroli Firenze 28"
43 Markus Wildauer 1998 Austria Tirol KTM Cycling Team 28"
44 Jakob Dorigoni 1998 Italy Team Colpack 28"
45 Simon Carr 1998 Great Britain A.V.C. Aix-en-Provence 28"
46 Natnael Tesfazion 1999 Eritrea Dimension Data CT 28"
47 Simone Sano 1997 Italy Overall Cycling Team 28"
48 Axel Narbonne-Zuccarelli 1998 France A.V.C. Aix-en-Provence 28"
49 Manuele Tarozzi 1998 Italy Inemiliaromagna 28"
50 Sebastiano Mantovani 1999 Italy Viris Vigevano 28"
51 Andrea Bartolozzi 1999 Italy Viris Vigevano 28"
52 Michel Piccot 1997 Italy Biesse Carrera Gavardo 28"
53 Gianni Pugi 1997 Italy Sangemini - MG.Kvis Vega 28"
54 Aldo Caiati 1998 Italy Zalf Euromobil Désirée Fior 28"
55 Nikita Bersenev 2000 Russia Lokosphinx-elite 1' 04"
56 Manuel Zobrist 1997 Switzerland Akros-Thömus 1' 04"
57 Harrison Wood 2000 Great Britain A.V.C. 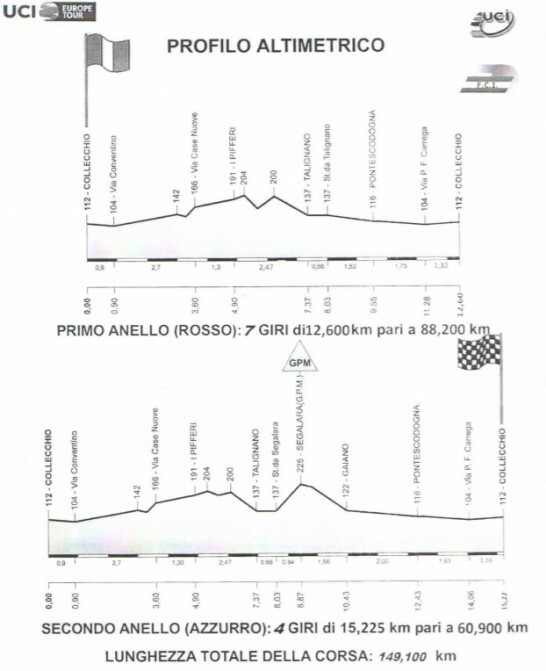 Aix-en-Provence 1' 17"
58 Mulu Hailemichael 1999 Ethiopia Dimension Data CT 1' 17"
59 Javier Montoya 1997 Colombia Beltrami TSA-Hopla-Petroli Firenze 1' 17"
60 Matteo Zandomeneghi 1999 Italy Iseo Serrature Rime Carnovali 1' 17"
61 Lois Dufaux 1998 Switzerland Akros-Thömus 1' 17"
62 Giulio Masotto 1999 Italy Team Colpack 1' 17"
63 Matteo Panarotto 1999 Italy General Store 1' 17"
64 Mattia Taborra 1999 Italy General Store 1' 17"
65 Stefan Kolb 1997 Austria Maloja Pushbikers 1' 17"
66 Nicolo Parisini 2000 Italy Beltrami TSA-Hopla-Petroli Firenze 1' 17"
67 Stefano Baffi 1998 Italy Cycling Development Guerciotti 1' 17"
68 Lev Gonov 2000 Russia Lokosphinx-elite 1' 17"
69 Adam Stenson 1998 Ireland U.C.Monaco 1' 17"
70 Nurbegen Nurlykhassym 2000 Kazakhstan Astana City 1' 17"
71 Leonardo Giani 2000 Italy V.C.Mendrisio-PL Valli 1' 17"
72 Luca Riva 1997 Italy Velo Racing Palazzago 1' 17"
73 Enzo Faloci 1998 France A.V.C. Aix-en-Provence 1' 17"
74 Gabriele Porta 2000 Italy Delio Gallina Colosio Eurofeed 1' 17"
75 Riccardo Lucca 1997 Italy Work Service Videa Coppi Gazzera 1' 17"
76 Kristijan Hocevar 1999 Slovenia Meblo Jogi Pro-Concrete 1' 17"
77 Luca Coati - Italy Team Casillo Maserati 1' 17"
78 Marco Cecchini 1998 Italy Sangemini - MG.Kvis Vega 1' 17"
79 Samuel Mugisha 1997 Rwanda Dimension Data CT 1' 17"
80 Sebastian Castaño 1997 Colombia Beltrami TSA-Hopla-Petroli Firenze 1' 17"